I recently had the good fortune of corresponding with Sean Guillory, host of the SRB Podcast and Digital Scholarship Curator in the Center for Russian, East European, and Eurasian Studies at the University of Pittsburgh. Below is the Part II of our virtual conversation; Part I may be found here. Public-facing writing (and even podcasting) about Russia and Eurasia has become a crowded field in the Anglophone world, never more so than after 2016. 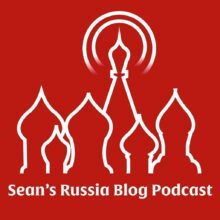 How does Sean’s Russia Blog distinguish itself in that field? I try to feature topics that many people don’t know about unless you’re steeped in academic literature. My one issue is that I’m not really good about planning over the long term. Most of the interviews I do is because publishers send me a book or I read something that I think is interesting. I have my own tastes, of course. The other thing I’m doing is incorporating more events we have at the Russian, East European and Eurasian Studies Center at the University of Pittsburgh into the podcast. I did my first series last semester on youth in Eurasia and all of the programming is online as podcasts. If doing the same this semester for a series titled Spying, Archiving, Reporting: Information in Eastern Europe. Academic talks tend to generate very small audiences, maybe 10 people on average. Over 20 if you’re lucky. Academic departments and area studies centers spend a lot of money to bring speakers out, usually $1000 to $1200 a pop. And it’s really a loss to have someone give a talk and the content just goes into the ether. What I’ve done at REEES is organize less formal academic talks (which honesty can be hit or miss, and sometimes downright boring) and do more live interviews with an audience, record it, and release it on the podcast. So, I get that 10-20 people at the university, but the podcast gets around 5,000-6,000 listeners. This way more of what we do at Pitt gets captured and offered to the SRB Podcast’s audience. I’m also planning on doing different types of audio content. Currently, I’m doing research on Lovett Fort-Whiteman, an American black communist from the 1920s, who was arrested in the Soviet Union in 1937 and died in a Sevvostlag labor camp in Magadan in 1939. My goal is to do an audio documentary series on African-Americans, communism, and the Soviet Union in the 1920s and 1930s told through his life. I think we who either produce or engage with academic work need to seriously reconsider what we do, why we do it, and whom we do it for. I remember in my first year of grad school, one of my professors said that his audience was the handful of experts around his topic. I found this really shocking, but at the same time, I couldn’t blame him. Academia is structurally designed so that all you have to do is impress a handful of people— peer reviewers, tenure committees, experts in your field and the people who might review your book in an academic journal, etc. I find this really sad—not to mention incredibly unimaginative—given the amount of blood, sweat, and tears people put into their work. Now, I’m not saying that every academic needs to devote themselves to the wider public. Let’s be honest — some just aren’t suited for that. I am saying we need to reconsider issues of access and how we can utilize various technologies to make the border between academia and the public more porous. We all lament the lack of historical knowledge, the “crisis” of the humanities, and the assault on the university. We are constantly charged (often unfairly) with the need to defend our “relevancy.” This is part of what I’m trying to answer. And I’m not alone in this, of course — the New Books Network and 15 Minute History are just two among many examples of this type of work. Nevertheless, there is a lot of academic knowledge production and presentation that are in desperate need of upgrading or rethinking: conferences, academic journals, peer review, tenure and promotion evaluation, just to name a few. Unfortunately, academia remains an incredibly conservative profession despite the fact so many progressive and radical people supposedly inhabit it. Who is your target audience? Who is your ideal reader, the one you keep in mind when you write opinion pieces or invite guests to your podcast? My target audience for the podcast is anyone who is interested in Eurasia, especially if they aren’t the usual suspects: academics, policy-makers, think tankers, students, NGO workers, etc. I did an audience survey a few years ago (I need to do another) where only 40% of the respondents were the usual suspects. Over half were “civilians.” There was even one who said s/he was a long-haul truck driver. I was especially proud of that. I don’t usually imagine an ideal reader when I write or invite guests. I don’t usually say, “oh, this topic will be great because it will get a lot of listeners.” I’ve done that on a few occasions, but not often. You are also a translator, in particular for Meduza. How has translating Russian-language news stories for Anglophone consumption affected your work as an editor and, more generally, as someone who writes and thinks about Russia and Eurasia? I did translate in the past for Meduza, but it’s been a while. I don’t have a lot of time for it nowadays, though I do think of doing it, especially when one of my lefty friends in Russia writes something that I think non-Russian readers should know about. But I don’t even do that as much as I’d like to. Nevertheless, I think translation is really important. What Kevin Rothrock does at Meduza is an incredibly vital contribution. I wish Meduza would devote more resources to their English side. But I understand that the audience is limited. Translation of Russian media—especially the serious journalism that outlets like Meduza do—opens non-Russian reading audiences to sides of Russia that is out of reach if you don’t at least read the language. It’s ironic that, during the Cold War, the US government would translate tons of Soviet media. And that stuff was mostly terrible in terms of quality. But now, when Russian journalism is better than it’s ever been—there are some really wonderful young journalists working in Russia—translations are few and far between. Besides bringing many important untold stories to the public, another important aspect of translation is that it shows non-Russian-reading audiences that there is a Russian media out there that does excellent work and that not all Russian journalists are zombie Putin surrogates, etc. In fact, I would say that it’s because of Russian journalists writing in Russian that we know so much about Russian society. It’s also because of them that we know about the hacking, troll farms etc—many of the stories American media is currently obsessed with (but have unfortunately taken to conclusions that are often fanciful). One of my pet peeves is that Russian journalists often don’t get the recognition they are due. You’ve written for some pretty left-leaning outlets, including Jacobin. Where do you think a leftist Russia expert fits in today, either within Russian or American political discourse? I think a leftist like myself can play two important roles. One is to stress that Russia is a capitalist country enmeshed in a capitalist global economy. Russia is often perceived by some as neo-Soviet; there is also the idea that Putin wants to reestablish the Soviet system. Or subconsciously, it’s not even considered that Russia is capitalist with all of the references using Soviet flags or even calling it the “Soviet Union” even though that system collapsed 25 years ago. In fact, this imagination of Russia as either not capitalist or as an abnormal form of capitalism is just another way to “other” Russia and, through that “othering,” to make Europe and the US appear more “civilized.” But capitalism has always been uneven and different across space as a “really existing” system. Capitalism exists in relation to the place in which it functions; not just on the national level, but regionally. Sometimes even within the same geographical space. No one can say that “rule of law” or “property rights” are the same in, say, a poor, mostly African-American neighborhood next to where I live in Pittsburgh as it is in a middle-class, mostly white suburb of Pittsburgh. The various class, racial, and economic relations, to name a few, inevitably shape the way “property rights” or the “rule of law” function as material forces in those spaces. Much Russia commentary in the US looks at Russia through an idealist lens of what democracy, capitalism, human rights, law, etc should be that is completely divorced from material conditions. In Russia, too, there are capitalisms that produce a variety of relationships and environments that are shaped through class relations, relations to production and consumption, political relations and ideologies, ethnic and gender relations, family relations in the home and worker-employer relations in the workplace. Also, we can’t understand Russia today without examining—and this is what Tony Wood has done so well in his book Russia Without Putin—the particular ways Russian capitalism developed in the 1990s and how those forms integrated Russia into a larger regional and global system. Here too, there is a tendency among some to see the 1990s as the “good” capitalism and the capitalism under Putin as the “bad” capitalism. Rather than ascribing any moral or even political values to it, it is better to see it, as I think Tony has done, as capitalism as it is and how the correlation of class forces was fundamental to the Russia we have today. Many Russians charge American commentators with hypocrisy, an anti-Russian bias or Russophobia. While there certainly those types of people, I think they are a very small minority. I don’t even think “Russophobia” is all that prevalent among people who look at the country closely. Rather, ideology has in many ways shaped the American world view where the world is considered through the lens of Capitalist Realism—that is, following from Socialist Realism, a representation of the material world as how it should be, not how it is. So much of Russia analysis, and the policies that come from that analysis, is based more on the Russia we want rather than the Russia we have. So much of especially liberal commentary sounds no different than a kind of evangelism that seeks to either “convert” Russians to our way of life, or, if they refuse to be converted, “punish” them for their transgressions. David Foglesong, in his book American Mission and the ‘Evil Empire’, quoted William Walling, an American socialist from the early twentieth century, who advocated for a “United States of Russia.” What he meant was that Russia had become the US as part of some eschatological component of its history. We are living with the same idea today, where Russia’s level of civilization is measured according to the distance we imagine it from ourselves. On this point, I keep coming back to Homi Bhabha’s notion of “almost, but not quite” in his essay “Of Mimicry and Man.” Russia is constantly evaluated based on this gap between almost Western, but not quite. They may appear to be white Europeans, the narrative goes, but there is something about them—here media references to, say, “corruption” being in Russians’ genes is instructive—that prevents their full “conversion” to the “correct” way of life. These perceived obstacles have included communism, Tsarism, the Orthodox Church, their Slavs, corruption, “love of the iron fist,” etc., according to the trope of the day. That gap, that space between “almost” and “not quite,” I think, has led to a certain unconscious frustration among the liberal-democratic missionaries. But it has also led to certain anxiety in the “West” in terms of what Bhabha sees as mimicry. Russians mimic the West—and here the idea of the mimic is absolutely central as a form of performance or miming—that is, they “almost” resemble the West. But since they can only mime that performance, without ever inhabiting it fully, there is something menacing or threatening about it, because it is perceived as a form of subterfuge or a trick. But this logic runs even deeper: Russia must only be the mimic in the end, because it discursively serves as an important Other that the West can use to constitute itself. Russia’s “failure”— its “not quite”—is what allows for the West to remain the “norm” for civilization. I should say, though, that this is an analysis some Russians, especially liberal Russians, ascribe to themselves. They, not unlike their liberal counterparts in the US, tend to conjure domestic Others to inflate their civilizational level and historical importance. We certainly saw it in Hilary Clinton’s “deplorable” comment. And then, of course, there’s the role a constituted, uniform, imaginary Western Other plays to define and consolidate Russian identity. That is an issue in its own right.